This weekend I made a three course meal and, as we were having pasta for the main course (my lovely Venetian Duck Ragu recipe), I thought to avoid that overfull feeling, starting off with a light but tasty salad would be the way to go. When I started to think about salad combos, I thought that this salad, being a combination of some of my favourite foods, would be a real treat and, as luck would have it, I had most of the ingredients in my cupboards already. 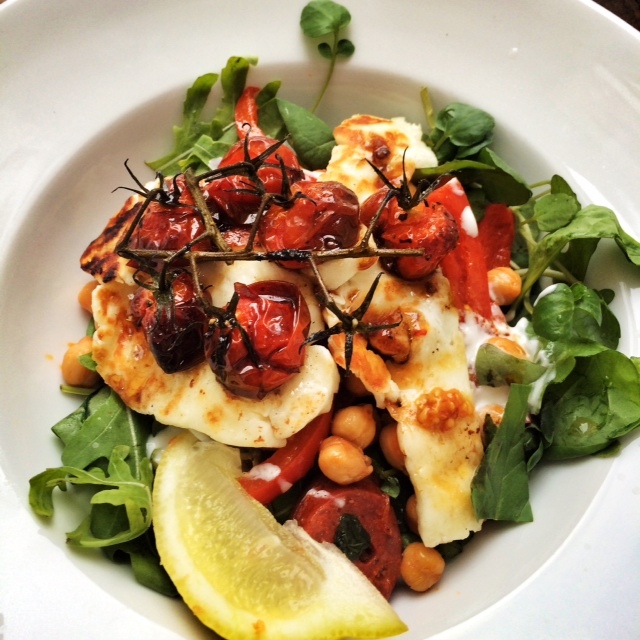 It’s a delicious salad which my OH (who claimed previously to dislike halloumi and chickpeas) wolfed down in about thirty seconds. The roasted vine tomatoes are amazing and add a different element to the salad which everyone loved. I served the salad in bowls as it keeps all the ingredients together nicely. Pop your oven on to 180c. Put your vine tomatoes in a baking dish, splash balsamic vinegar over the top, scatter garlic around and season with salt and pepper. Put in the oven, uncovered for 1 hour. When your tomatoes have 15 minutes to go, put a good handful of salad leaves in four bowls and pop your red pepper in a frying pan, spray with 1kal and fry for a minute or two. Then add the drained chickpeas and chorizo and fry for another five minutes. Add a little water if the pepper starts to stick. Squeeze in a little lemon juice, give a good stir and then distribute between the four bowls, topping the salad leaves. In the same pan, fry your halloumi for a minute or two on each side until it starts to get a nice colour then add this to your salad bowls. Dress each salad with a small capful of red wine vinegar and add a few drops of fat free yoghurt. Take your tomatoes out of the oven, pop on top of the salad and then pour the bubbly balsamic juices over the finished dish. Serve with a little slice of lemon.